I hear it all the time, “I’m a B2B company; social media is not for me.” But truth is, there are a lot of ways to use social media to advance your business to business product or service. In fact, B2B is the fastest growing sector for social media – although that could be because they’re so far behind their B2C and non-profit counterparts. There are several ways to use social tools to advance your business. 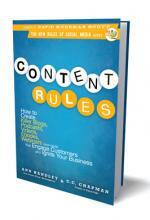 You can show your thought leadership though blogs, podcasts, videos and other content marketing methods. You can find potential customers that have questions or problems and offer assistance. You can build communities around your subject matter with LinkedIn groups. You can curate content from multiple sources and become a trusted source for information in your field. And that’s just the beginning. Here’s a closer look at some of these methodologies. One of the best ways to use social media channels for B2B is to create content that shows your thought leadership in your field. No matter how small a niche your product or service falls into, there are a group of people who are extremely interested in it. Many of your potential customers fall into that group. By creating content that offers helpful information on a consistent basis, you will gain a reputation as an expert, becoming one of their go-to sources for information. Then, when they need products or services, you will be among the first they think of. Creating your own blog is one of the easier ways to create content. Find someone within your organization that is both a good writer and passionate about your subject matter. Put that person in charge of your blog writing. Or better yet, put together a team to share the load. You can also invite guest bloggers to contribute. Embed the blog in your website and it adds fresh content that is searchable weekly. This will give you added SEO juice, driving more people to your site. If someone in your company is good on camera or good conducting interviews you can add video blogs or even a podcast to your content. Also, you can create white papers and webinars. Also, video team members making presentations and add the presentation slides to Slide Share. You could even create a series of helpful web videos. 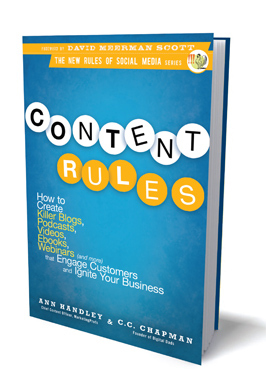 If you need ideas on how to create all this content and use it for your company, a good “how to” guide is the book Content Rules by Ann Handley and C.C. Chapman. You don’t have to always create your own content. Another way to become a trusted source for information in your field is to curate existing content. There is just so much stuff out there on the web to choose from. Helping others find the best of what’s there is another way to be helpful. Curation could be as simple as finding good content and sending it out on a regular basis via your twitter or Facebook account. You also can create a regular eNewsletter where you send out the top stories of the week or month. During his Future Midwest presentation Starr listed off a number of good curation tools. One interesting tool was his own company Pearltrees which allows you to easily build your own “tree” of sites/articles you’ve found on the web, all relating to your specific area of interest and then share it with others. Storify is a company that allows you to create content curating news around a specific event, like a conference or big news event. Bagtheweb is another good curation machine. Curated.by curates news streams in real time. Keepstream groups your tweet stream by topic. Another way to connect with prospective customers is to use monitoring tools to find people experiencing problems you can help them with. The key is to not hit them with a sales pitch, but to be genuinely helpful. You can set up twitter searches for specific key words relevant to your company. You can set Google alerts for similar terms. And there are more sophisticated monitoring tools you can use if you’re willing to spend the money. Also, through your content and curating efforts, you may get people coming to you with questions. Nothing puts you in better graces with someone than helping them solve a problem. Even if they don’t have business they can give you, they’ll be likely to recommend you when they come across someone who does. These are just a few ways you can use social media tools to create prospects for your B2B company. And if there aren’t a lot of other companies in your field using them yet, that’s all the more reason to start now. It will help you stand out against your competition. So, if you or a B2B client is hesitant, don’t be. This is the time to start building your reputation and social media followers.